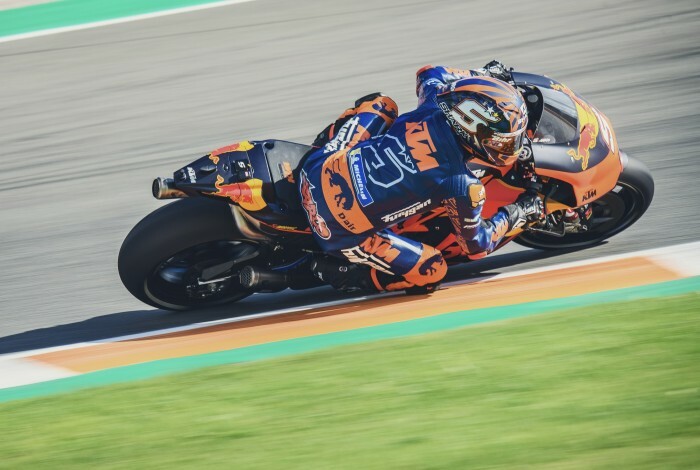 Johann Zarco is the much-vaunted replacement for Bradley Smith in KTM’s Red Bull-backed factory MotoGP squad but the Frenchman came away from his Valencian debut 1.7s off the pace and with two crashes under his belt. Team-mate Pol Espargaro, who has spent a lot of this year injured, has two seasons under his belt and put the RC16 on the podium at the Spanish track - albeit in a rain-lashed war of attrition - and finished the test only 0.643s down. While some riders that have changed bikes are basically only sitting on different colour scheme, Zarco has three big challenges to face: a new engine configuration, a new suspension manufacturer and, most importantly, an entirely new frame. The Frenchman is used to a inline four, wrapped up in an aluminium beam or perimeter frame which has Ohlins hanging off it. On Tuesday, he rolled out with a V4 in a steel trellis frame using WP suspension. And it showed. “It’s a shame, I had two crashes, but I didn’t have any injuries, that’s important, and it helped us to really understand the weak point of our bike. And I also understood things about my riding that also on this bike, I will have to also a little bit my riding style. So step by step, I’m building up that advantage,” said Zarco, speaking at the track. Zarco’s main issue is the chassis. He is used to one that is very rigid with comparatively little flex. The steel chassis used by KTM will be much more ‘springy’ as Casey Stoner used to describe Ducati’s version so will move around more. Added to that is the suspension, which really only serves to control how quickly weight is distributed front and rear when braking or accelerating. Zarco is, like the rest of the pitlane, used to Ohlins stuff which works in a certain way. Now he has to use WP - a subsidiary of KTM - which will work in a different way to achieve the same result. Changes will have to be made. I’m already thinking about changing things in my riding style, but what was strong on the Yamaha must also be strong on other bikes,” mused Zarco last night. “I can follow Marc, and I can see that he is strong on entry, not just because of his skills, even if he has something maybe better than the other riders, but also because the bike is giving him the possibility to go.